«The rig onboard PUMA’s Mar Mostro failed at around 15:00 UTC in the southern Atlantic Ocean, about 2,150 nautical miles from Cape Town, South Africa. Skipper Ken read reported: “We were sailing on a port tack, beam reaching in 22-23 knots of breeze, heading east northeast with eight to 10 foot waves when the mast failed. There were no warning signs. “There was no panic onboard, and all crew are safe and well. 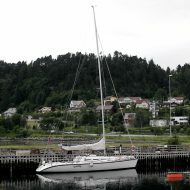 “Thanks to amazing seamanship, the three pieces of the mast and all of the sails were recovered. We haven’t suspended racing at this point and are weighing are options. “At this point we are not using our engine, but are taking some time to clear our heads and evaluate next steps. Our plans may include heading to the island of Tristan da Cunha – about 700 nautical miles from us, nearly on the way to Cape Town. “This is the saddest and most disappointed 11 people on earth. We were in a comfortable second position, traveling south to get into the final front and head across the southern Atlantic towards Cape Town. The Brazilian search and rescue organization have been informed and are on standby to assist if necessary.